In the Autumn of 2011, I traveled 9,600 miles through 21 States in 72 days in a 21 foot Coachman-Freedom-Express RV, aka recreational vehicle, with my husband and his son. It was a sightseeing journey of a lifetime through mountains and valleys, past gorges and oceans, into forests and National Parks in a motor-home that, by most folks standards, is way too small a space for 1 person let alone 3! 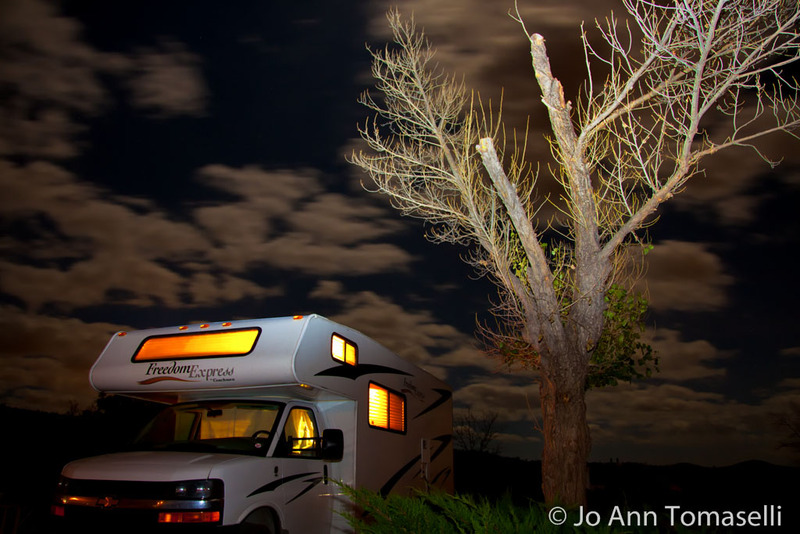 This entry was posted in Uncategorized and tagged art, camper, campsite, Coachman-Freedom-Express, destination, fine art photography, holiday, image, Jo-Ann-Tomaselli, JoAnnTomaselli, joanntomaselli.wordpress.com, journey, leisure, leisure activities, lifestyle, motor vehicle, motorhome, nature, photograph, picture, recreation, recreational, road trip, RV, sightseeing, summer, transport, transportation, travel, vacation, vehicle. Bookmark the permalink. ← H E Y! D. O. M. I. N. O.
I love this image…and your great adventures! Great! I’m looking forward to hearing about your adventures! Thanks go out to my 3 favorite bloggers – Sharon, Lianne & Douglas – you all inspire me to write more! Can’t wait to read about your adventure! Joanne….I have a new boyfriend. He restores vintage trailors. Just experianced my first trip to ole town in Kissimmee that was so intersting and lots of fun! I love your photos of the RV and reflection on the lake . You really captured so beauties! We are really enjoy your works of art in photography. You truly are gifted ! Thank you so much Suzanne – Your so kind!